Engraving of Elisha Nye Jones, a Captain in the Civil War, who died at Libby Prison in Richmond, Virginia, of injuries received in the Battle of Bull Run. Approximately 10-1/4" x 7-1/4"; the right edge shows that it was removed from a book. The engraving may have been removed from "A Child's History of the United States, Vol. II, by John Gilmary Shea, L.L.D., published in New York by Mac Davitt & Company, 1872, as I saw the same illustration there. It's digitized here. Someone has written the following on the reverse. "Capt. 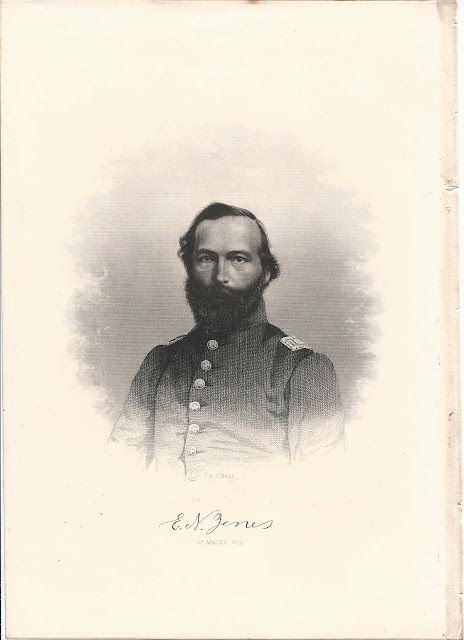 Elisha N. Jones, 2nd ME Vols, mortally wounded and captured July 21, 1861, Bull Run, Virginia. b. Sept. 8, 1819, Holden, ME." I found another place and date of birth for him on Family Search: 7 September 1821 at Orrington, Maine, which abuts Holden. Elisha Nye Jones was born 7 September 1821 at Orrington, Maine, the son of Luther and Lucy T. (Nye) Jones. He married Sarah T. Eldridge on 26 December 1842. She was born 15 July 1823 at Holden, Maine, the daughter of Seth and Sarah. N. (Fisher) Eldridge. 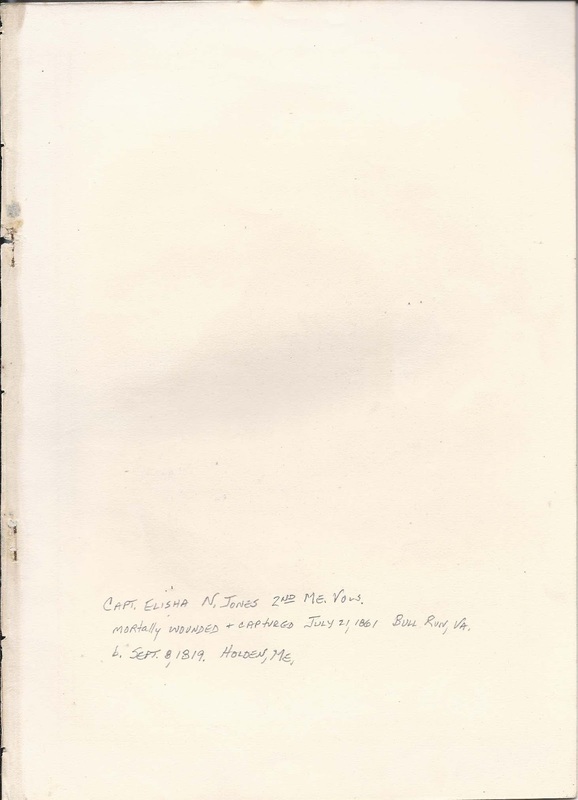 Elisha became a captain in the 2nd Maine Volunteers and was the first Mainer to fall wounded at the Battle of Bull Run. He was captured and taken to Libby Prison at Richmond, Virginia, where he died of his wounds. After Elisha's death, Sarah married Thomas Trickey, a wealthy merchant and landowner of Bangor, Maine.